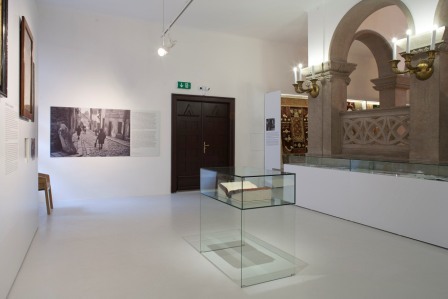 "The Jews of Bratislava and Their Heritage" is the permanent exhibition of the Jewish Community Museum installed in the women’s gallery of the Heydukova Street Synagogue in Bratislava. This unique museum was established by the Bratislava Jewish community to present its rich Jewish heritage and to open the synagogue building – an important monument of interwar architecture – to the public. The museum exhibition is installed upstairs and during the summer season is open to the public. The Heydukova Street Synagogue is the only synagogue in Bratislava. Constructed in 1923-1926, it is a Cubist building designed by the Bratislava-based Jewish architect Artur Szalatnai-Slatinsky and is listed as a national cultural monument. Orthodox in orientation, the synagogue still serves as an active Jewish house of worship. 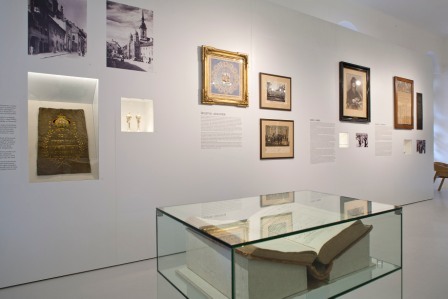 In addition to the permanent exhibition, the Jewish Community Museum currently presents works of European art that were looted from Bratislava Jews by the Slovak state during World War II. After 1948, when the Slovak National Gallery was established, these artworks ended up in its collections. The special exhibition "The Shadow of the Past" is a joint project of the Slovak National Gallery and the Jewish Community Museum and will last until October 13, 2013. The permanent exhibition of the Jewish Community Museum has been recently awarded the "Exhibition of 2012" prize by the Pamiatky a muzea, prominent museum journal in Slovakia. The Jewish Community Museum joins the annual European Day of Jewish Culture and the European Heritage Day in September.